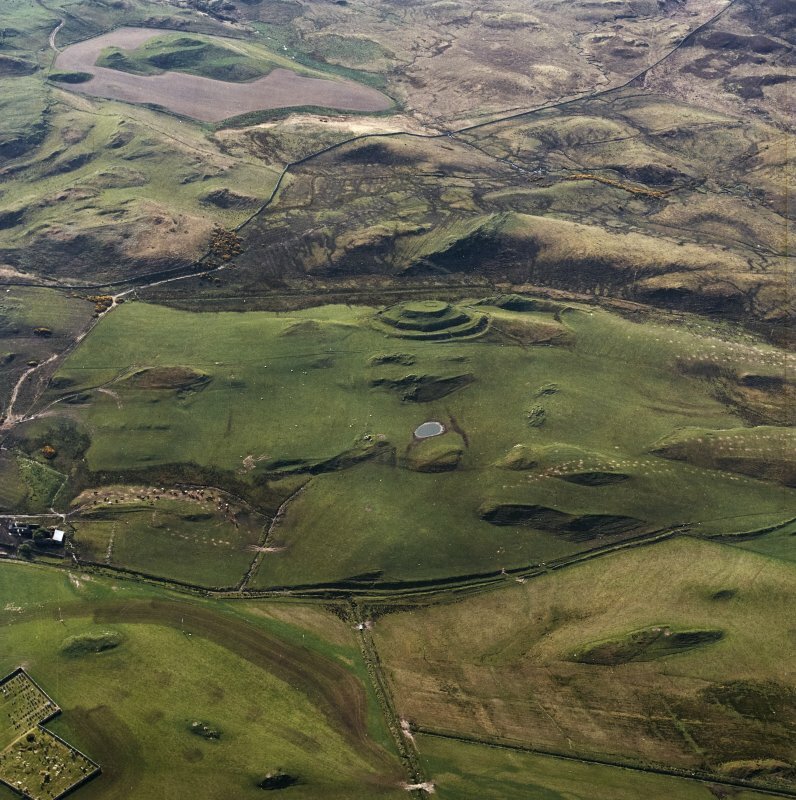 Oblique aerial view centred on the remains of the fort and rig, taken from the N.
Oblique aerial view centred on the remains of the fort and rig, taken from the NW. Oblique aerial view centred on the remains of the fort and rig, taken from the WSW. (Central Islay). Dun Ghuaidre, Kilmeny. An isolated eminence rising to just over 300ft [91.5m] above OD from cultivated fields, is entirely encircled by a massive-built stone wall enclosing an oval or subrectangular area 110ft [33.5m] by 54ft [16.5m]. In the centre is a square stone foundation about 10ft [3m] square. On the S the rock falls away sheer. On the other sides there are two ditches cut in the rock defending the slope. The entrance is at the SE corner, where a narrow causeway has been left between the cliff and the ends of the ditches. (This monument is 'closely allied in structure and stituation' to [nearby] Dun Guiadhre [NR36SE 9: Childe no. 9], both standing 'close to good agricultural land'). V G Childe 1935 (no. 13). Dun Guaidre: An isolated eminence rising just over 300ft OD is entirely encircled by a massive stone wall, enclosing an oval or subrectangular area 110ft by 54ft. In the centre is a stone foundation about 10ft square. (Newall notes a corn kiln, 6ft in diameter at NR 389 648 but of (M) 3 & 4). The rock face is sheer on the S, the other sides are defended by two rock-cut ditches. The entrance is in the SE, where a narrow causeway has been left between the cliff and the ends of the ditches. V G Childe 1935; F Newall 1969. Dun Guaidhre is generally as described above. The fort wall has been robbed and survives only to 0.3m in internal height. The outer defences comprise three ramparts and ditches surviving untouched in the SW, but elsewhere the ramparts have mostly been levelled giving a terraced profile. The outer rampart has been destroyed in the N and NE. The citadel and inner rampart are entered from the east, the second rampart from the north. The stone foundation within the citadel abutts the south side. It measures 7.6m by 5.0m within a turf covered stone wall spread to 1.5m. Presumably it considerably post-dates the fort. Visited by OS (J B), 10 June 1978.
aligned NE-SW, with rock faces forming much of the SE side and SW end, and rises about 19m above the adjacent rough pasture. 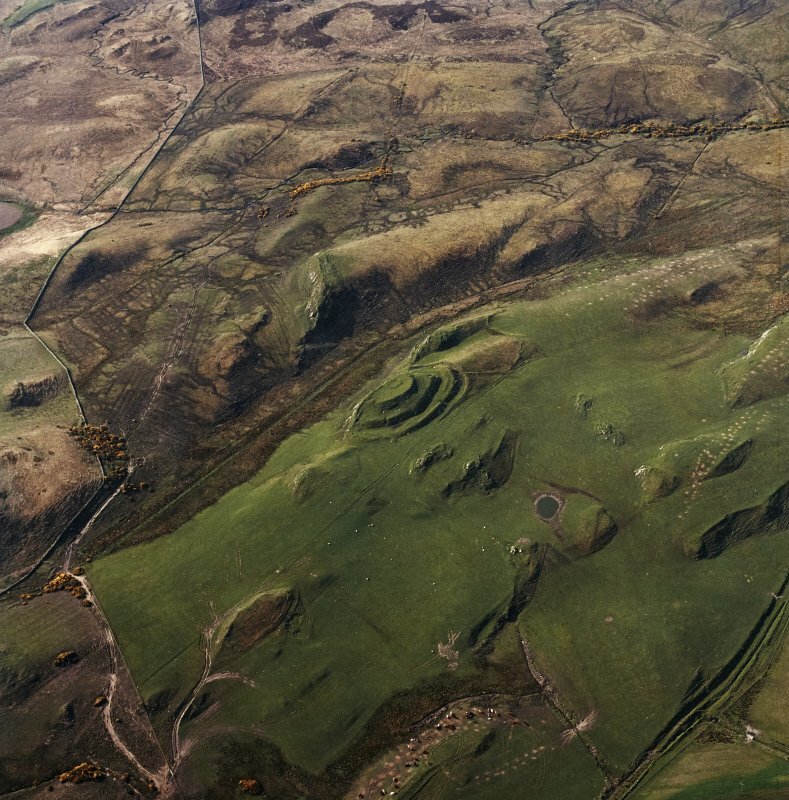 The defences comprise a wall (A on the RCAHMS published plan), built round the perimeter of the summit, and three ramparts (B-D on RCAHMS plan) ranged in tiers down the NW side and the two ends. Wall A encloses an area measuring 34m by 17m; it has been heavily robbed and, except for a few outer facing-stones, little can be seen. Along the SE side, however, there is a thin spread of stony debris, and at one point where the core material is exposed, it consists of rubble and soil and indicates that the wall was originally a substantial structure. The entrance is on the ENE, and the interior has been under cultivation at some stone enclosure probably associated with recent field boundaries which overlie the fort in several places. 0.5m externally. Along the NW side and round the NE end, the ramparts have been reduced or levelled, and the ditches largely filled, by ploughing. The entrances through ramparts B and C are situated on the N and NNE respectively. The steepness of the SE flank of the ridge rendered unnecessary any defence other than that provided by wall A.
RCAHMS 1984, visited June 1979. This is an unusual fort in islay and Argyll, not for its position on a ridge with a rock crag forming the SE flank, but for its use of ditches in the defences, which rise in four tiers to a relatively small enclosure crowning the summit (see also Atlas No. 2154). The latter measures 34m from NE to SW by 17m transversely (0.04ha) within a rampart reduced to an external scarp dropping down to a point where what may be occasional outer facing-stones can be observed. The slope below this has probably been scarped also, partly to provide material for the first of the outer ramparts, now reduced to a terrace, which is also accompanied by an external ditch some 3m below its crest. Set a short distance outside this ditch is yet another rampart, in this case still standing 1m high internally on the SW and dropping 3.2m into the bottom of an external ditch with a counterscarp bank, which survives only around the SW quarter. While at first sight the crag on the SE appears largely natural, close inspection suggests that it has been extensively modified, in effect to carry the outer ditch around this flank. The entrance to the fort climbs along the crest of the crag on the NE. 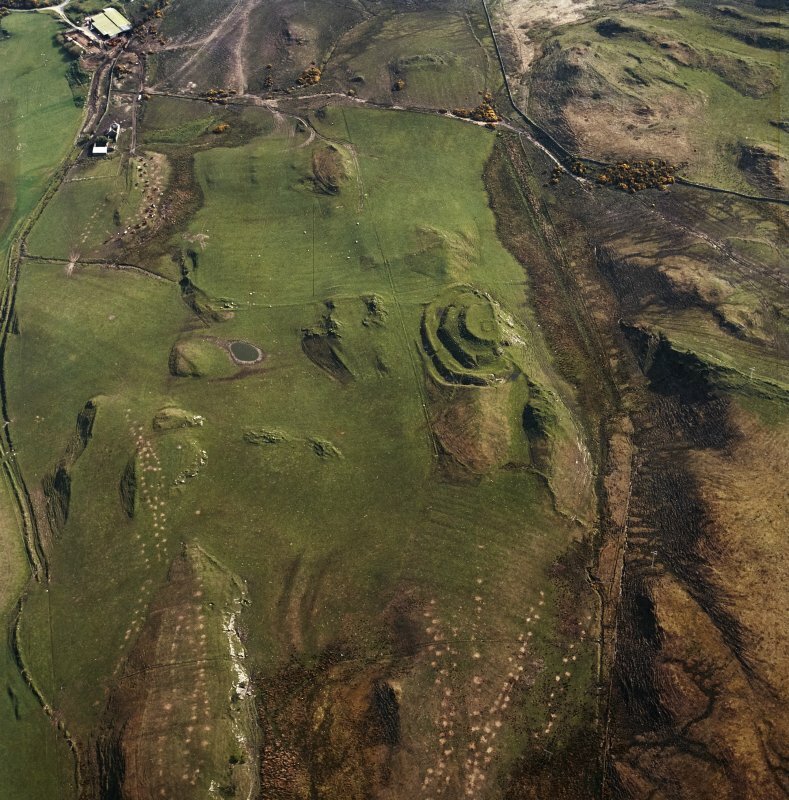 The defences are overlain by later field banks on the NE, S and W, which may be contemporary with the small rectangular enclosure that can be seen within the interior.